SF Author and astronomer Mike Brotherton provides some guidelines for science fiction writers who want to don't want their story set on a distant planet to seem scientifically out of date in light of recent astronomical discoveries. This visually striking video takes a look at why Mars and Venus may have been stripped of their atmospheres while Earth was spared. What saved us? Magnetic fields and the moisture in the atmosphere contributed. I wonder what this means for possible plans to terraform Mars: is it risking failure because the planet cannot hold an atmosphere? or could we get around that problem continuously replenish the air? • How should we update Boyle's list of problems for scientists? In the 1660s chemist Robert Boyle wrote a list of 24 problems for scientists to solve. While some of his goals - like the art of flying and methods of determining longitude - have been solved, Boyle thought big, including some goals that scientists are still working towards 300 years later. We've made progress towards "recovery of youth", "prolongation of life" and "curing wounds at a distance" since Boyle's day, but research in those fields is still ongoing. But Matthew Baggott wanted to know what great visionary goals could be set for today's scientists and so started a discussion at Quora: check it out! You can see a scan Boyle's original list on the Boyle Project's collection. • How a T.Rex named Bob is brining about a revolution in paelontology. Koan de Paus explains how there may be hope yet for Jurassic Park-style cloning of dinosaurs. A key finding: a fossil from a pregnant T.rex nicknamed Bob that contained a fragment of soft tissue. I'm not sure I'm convinced, but it's fun to think about. 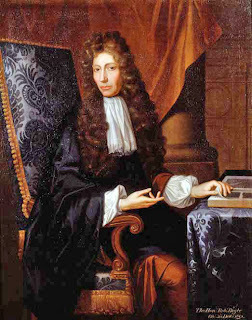 Image: Portrait of chemist and visionary Robert Boyle by Johann Kerseboom c. 1689.